I'm not sure what happened to the original page that I made "In Praise of KE's" but I do know that I deleted it and all of the pictures associated with it! It was very easy to find more pictures to use. 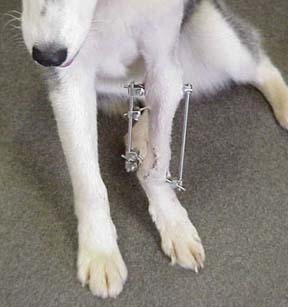 KE's (Kirschner-Ehmer) devices are used to hold bones in place by bracing them to external supports. The general principle is that pins are driven through the skin under "sterile" conditions that enter the bone and are thus firmly attached. 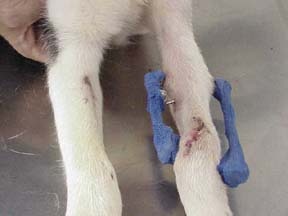 These pins are rigidly clamped to bars that follow the bone outside of the skin and then are attached to other pins beyond the fracture line. The big advantages of this method of fixations includes the fact that no "metal" has to be in the vicinity of the frature itself. A second big advantage is that by using good equipment and geometry the supports can be very rigid. 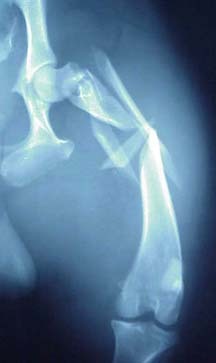 A third advantage is the adaptability of the technique to many fracture types. A fourth, and what I'm trying to show here is the the position can be change after the repair is finished. This case is an example of a surgery where we were trying to straighten the leg of a pup that had a fracture occur during growth. The original fracture healed but one of the two bones below the elbow quite growing while the other continued growing. We changed the angle in the first surgery but could not correct it as much as was needed because of muscle contracture. Zues was a young growing "Min Pin" that took a dive off of the balcony while playing with his buddy the cat. As you can see in this picture both femurs were broken about 4 cm above the knees. Plates could have been used in this repair but it would have been difficult to get enough screws into the bone without crossing the growth plate and causing problems with growth. Also the surgery time to "plate" both femurs would have been quite long. 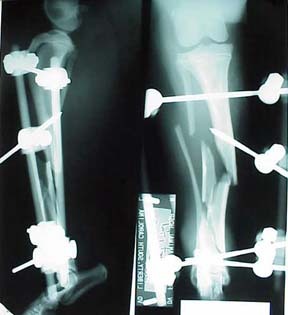 Pins, by themselves would not allow enough stabilization of rotation with these fractures. By combining intramedullary pins and simple external fixaters we were able to keep surgery time and expense down. 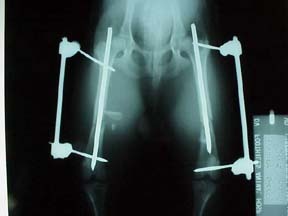 The IM pins were placed by "feel" rather than opening the leg to minimize tissue trauma. The external fixaters were place across the growth plates but were not a factor in inhibiting growth since they were removed in about 3 weeks and could be adjusted each week to lessen tension. Some fractures simply require bone plate fixation. 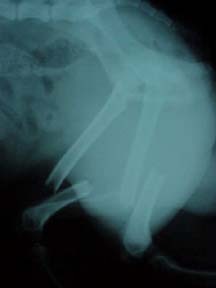 This fracture of a dog named Shadow was simply so complicated that it had to be put together like a puzzle. Shadow was not a young dog and it was scary to have him under anesthesia for long enough to put things back together. We were very happy when Shadow did well but the surgery time to put all of this "stuff" together was very long. Lot's of problems were encountered during the recovery. In the end things went well but it took a long time, it was expensive and now, if we do things like we're supposed to, we should schedule a surgery to remove this plate. I would ask you to think about what would be involved with removing the plate from this leg! Now, any orthopedic surgeons out there will have a LOT of things to criticize when they see this x-ray. How can this terrible alignment heal? What about those huge gaps? This doesn't look near as PRETTY as Shadows does it? How about if you add the fact that this was an open fracture full of infected road debris? This goes back to major advantage number one. Having done this before I knew that if the fracture site is stable there is a really good chance that we could control the infection. We removed the device from the patient in less than 3 months and the patient uses the leg. The large dog uses the leg normally. I would say that KE devices allows us to do what you might consider to be a "sloppy" job and may be better in the end. If the fractured bones are not disturbed they really want to heal back together. Sometimes acheiving perfect alignment by disturbing the tissues is counter productive. Judgement always has to enter into the process. One of the things that I have learned during my "voyage" in veterinary surgery is that each surgery is different. One of my professors (a very famous one . . . Joe Bojrab) drove me nuts and at times seemed to be interested in crazy proceedures. However, one day I was asking him about what he thought about some proceedure. He told me that whenever I am confronted by a problem that I didn't know how to handle I should simply go back to the basic princlples. If you stick with the basic principles there will always be some combination of things that you can do to solve any surgical problem. Because of that conversation I always try to take a night of thougt before each unique surgical proceedure to think through the principles before I do any orthopedic proceedure. I try to have plan A, B and C in mind before I start. I don't remember the last time that one of those 3 plans didn't include a KE device.